No more valuable stitching time wasted while looking for missing needles. 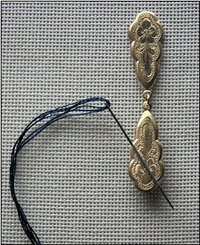 This stay can be attached to your canvas or fabric to hold your needle when you are not stitching. 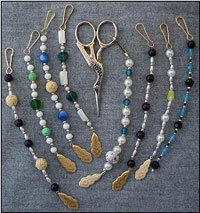 Scissor fobs are a charming way to keep track of your scissors whether attending a workshop or stitching at home. Each Victorian charm fob is approximately 6" long. Designs vary and antique beads are used when available. Fobs match the needle stays.